This assembly is a double glued down installation on an 8''concrete structure without suspended ceiling. 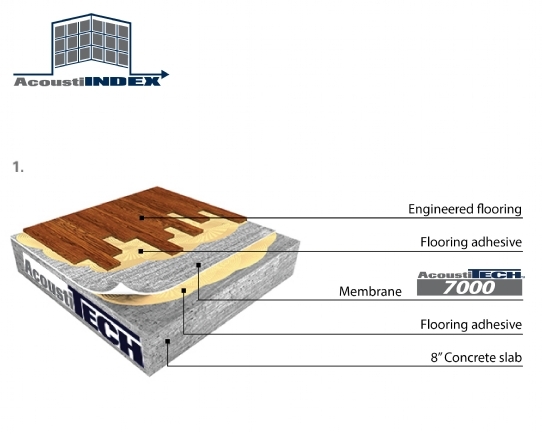 The AcoustiTECH 7000 membrane was installed under engineered wood flooring and glued with AcoustiTECH adhesive to ensure compatibility, durability and performance. AcoustiTECH is the only manufacturer that can ensure compatibility of components under the floor by offering both adhesives and acoustic membranes under the same brand. Lab and on site tests were made to ensure the stability of our products and avoid delamination, the hollow spots or other problematic situation. Our expertise goes beyond the acoustic products, providing you with support for your project (analysis of the plans, proposed various solutions to meet your needs and budget, etc. ).